Pineapple nutrition that will rev up your energy levels through the roof! Can pineapple nutrition transform your regular fruit smoothie into a new healthy treat? It sure can, and the taste is amazing. If you enjoy the rich, luscious flavors of a fresh pineapple, you are in for a delicious experience. Because this fruit was so expensive and rare in Europe for many years, it was a choice luxury. To be served a pineapple was a high honor and a sign of favor. Today this fruit is still the emblem of gracious hospitality. One taste of a sweet and juicy pineapple is all it takes to understand why people love it so much. 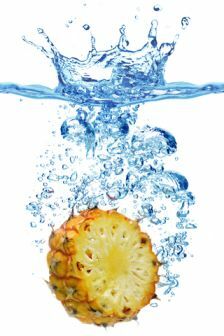 One of the benefits of pineapple is its ability to quench the thirst. The extra liquid in the fruit must be considered when you add it to any recipe in order not to create too thin a mixture. You can use canned pineapple as a smoothie ingredient, but the taste and the pineapple nutrition will be less intense than freshly cut pineapple. Fresh, fragrant pineapple is a much better selection to use if you have it available. Frozen is the next best option, then canned. The flavorful, natural sweetness of a pineapple makes it one of the fruits loved by young and old alike. You can cut a fresh pineapple and then freeze the sections that you are not going to use right away. This gives you a ready supply of frozen sweet fruit to use for smoothies, or other recipes, in the future. Frozen spears of fresh pineapple are also great snacks that the kids will beg you to fix for them. A pineapple can also be a fun way to enjoy your Vitamin C for the day. Just one cup of this nutritious fruit contains almost a complete day’s requirement of both Vitamin C and Manganese. These natural health energizers may help boost your immune system, soothe an irritable digestive tract, and fight off colds. Pineapples also contain many enzymes that assist your digestion. Pineapple nutrition gurus point out that one of these enzymes, Bromelain, is valued for its anti-inflammatory ability. If you have sore joints you will be doing a good deed for your body by adding pineapple to your diet. This enzyme will work to reverse the inflammation that is bothering you. In addition to these healthy facts a pineapple also contains potassium, B1 and calcium. All of these substances are crucial to a healthy body. Pineapples are even richly packed with antioxidants. Antioxidants are invaluable because our bodies need them to repair the cellular destruction and havoc caused by free radicals. This means that you can blend up and enjoy a delicious pina colada smoothie recipe and improve your health at the same time thanks to the benefits of pineapple. There are many choices for you to make when it comes to selecting pineapple from the grocery store or market. You will find many different types of canned and frozen pineapple lined up on the shelves. There are even bags of dried pineapple, cartons of pineapple juice and fresh, spiny pineapple catching your eye. The benefits of pineapple are present in all forms and products, but nothing tops a fresh specimen. Dried pineapple deliciously sweetens up your regular fruit smoothie recipes. But make sure that you use unsweetened dried pineapple. There is enough sugar already in the fruit and no need to add extra unneeded calories. Choose a pineapple that is fragrant and sweet. The aroma should not be too overpowering because this could indicate that it is just about to cross the “very ripe” line. It should be fairly firm to the touch and there should be no sunken, darkened or discolored areas on the outer skin. The skin itself should be brown with some gold or green showing. The green spiky leaves should not be dried and brittle. Always check the bottom of the pineapple for soft spots or damage before you make a final purchase. A pineapple will ripen as it sits on your counter at home but you must be attentive so it is not allowed to over-ripen and ferment. Once the fruit is at the peak of ripeness you should make every effort to enjoy the natural goodness of this pineapple nutrition.